Earl Jewett impressed his manager in this August 1990 game, getting into the ninth while giving up just two runs, according to The Sumter Item. "That was just a great job by Earl," Sumter manager Ned Yost told The Item afterward. "He was getting his fastball over, which is a big key for him. He was getting ahead in the count because he was throwing more fastballs for strikes." Jewett's performance ended up going for naught, his team losing 2-0. A Jewett performance earlier that year, though, was even better. He also got the win. That performance ended with a no-hitter. Jewett's career, though, likely didn't end up the way he had hoped. He played just one more season. He never made AA. 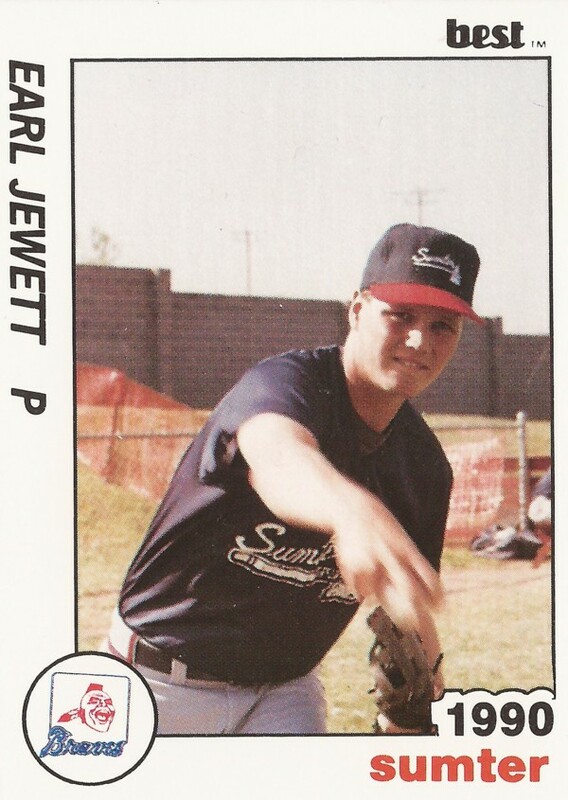 Jewett's career began in 1989, taken by the Braves in the 32nd round of the draft out of Wagner College in Staten Island. Jewett went to Wagner out of Bishop Gibbons High School in his native Schenectady, NY. At Wagner, Jewett struck out 20 in 19 fall innings in 1987. Jewett played collegiate ball the next summer in his hometown with the Schenectady Mohawks. He helped the team to the league title game. With the Braves, Jewett started at rookie Pulaski. In 14 games, seven starts, Jewett picked up two wins and had a 3.53 ERA. Jewett moved to single-A Sumter for 1990. He got 27 outings there, starting 12 and had an overall ERA of 2.40. It was in early July that Jewett threw his no-hitter against Spartanburg. And he almost had to be perfect as he won 1-0. Jewett played his third season back in the South Atlantic League, at Macon. But he got into just seven games, all in relief. He gave up four earned in 10 innings. It was his final time as a pro.